Revised edition of her best selling book "Free Yourself From Tranquilizers and Sleeping Pills: A Natural Approach." 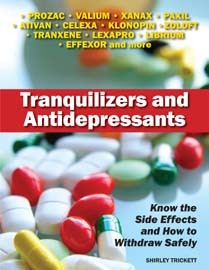 'Shirley Trickett's book on coming of tranquilzers and antidepressants is literally a 'life saver.' It is the one book which helps people cope with drug withdrawal by explanations and sensible advice. I trusted it and feel I would not have come through without it. It helped me to live again.